Last week I popped in at my cousin’s estate sale. She was selling items that belonged to her family that she reluctantly needed to let go, due to lack of space. She surprised me with our Grandma’s red Pyrex applesauce bowl. 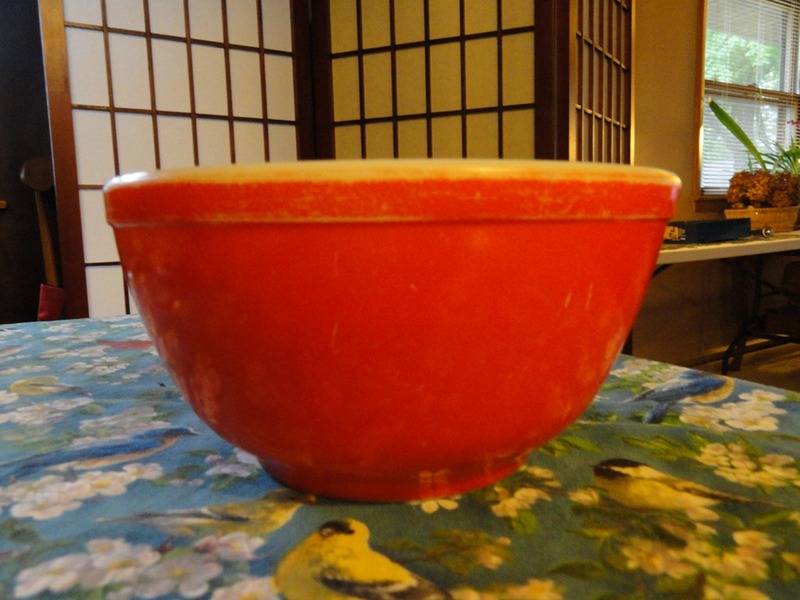 She said that Grandma always had fresh applesauce in her fridge in this bowl and the bowl was topped off by one of her 50’s “Fire King” Jadeite green plates. 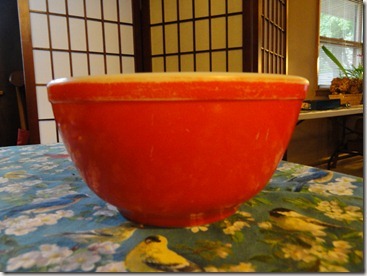 That was not a vivid memory of mine, but I welcomed the bowl because it belonged to my Grandma. I had no intentions of looking around at her sale items, but that thought lasted about one minute. I found a tri-fold screen, quickly. 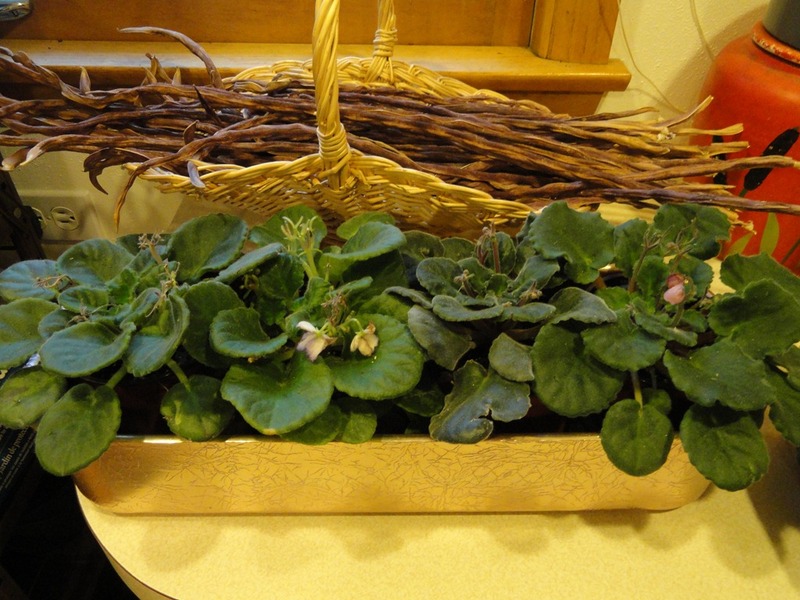 My cousin also suggested a copper plated planter. 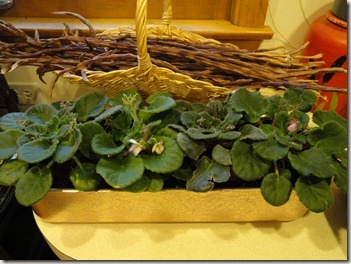 Upon looking at it, I agreed it would be perfect for my 4 African Violets. The bowl and the planter would be reminders of my Aunt and my Grandma. Perfect memorabilia for a sentimentalist. I hoped that my husband would understand as I carted more into the house than I had left with. Our discussion moved to her family farm in Arcadia. This was a farm jointly owned with our Grandparents and her father, and an uncle and it was called Burt Orr and Sons in the early years. I fondly remember them having cows that went out to pasture in the morning and were called in for the evening and milked. The cows had names like, Blackie, Brownie, and Brindle. Two of my cousins were in charge of bringing the cows in at night from the lower pasture. They carried big sticks and were in fear of their lives of the huge hoofed ancient animals laden with heavy utters. My Grandpa would be near the barn and be calling “Come boss” as they neared the barn. 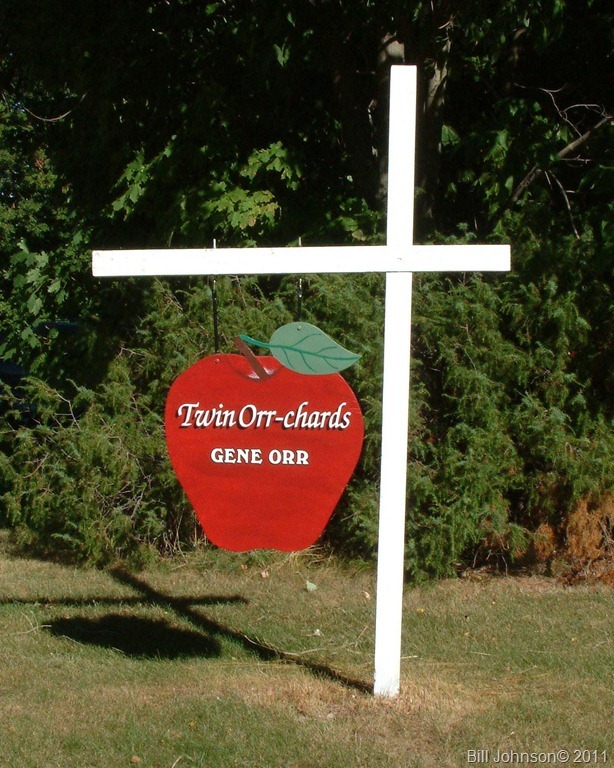 There were orchards with apples and cherries on the farm, as well. 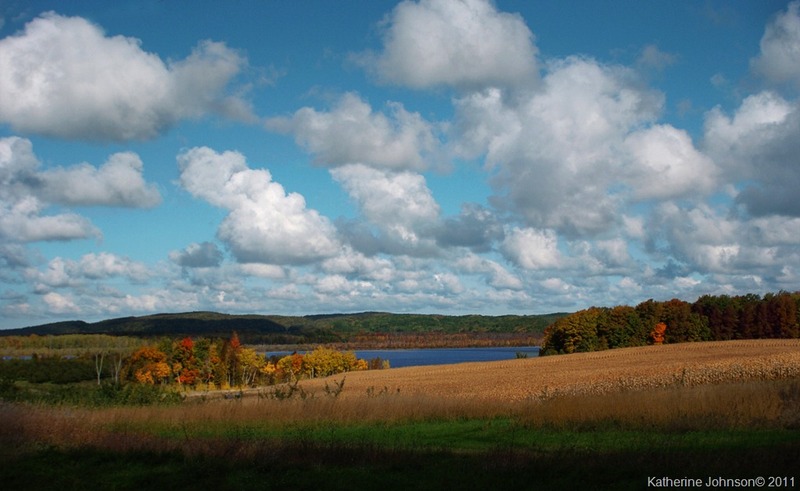 The farm setting overlooked the picturesque Upper Herring Lake which is tucked into the hills of southwest Benzie County in northern Michigan. During the hot lazy days of summer, we cousins would walk a couple of miles to Watervale to swim either in Lower Herring Lake or Lake Michigan. The road had very little traffic except for the nights that there were dances at the White Owl, then we heard lots of cars filled with teens ripping up and down the road late into the night. My aunt and uncle lived in the big house and my grandparents lived across the drive in the smaller house. My other uncle lived up the hill about two miles away. So if I stayed with my grandma, I could visit all my cousins, too. Or if we had hissy fits, I could return to my Grandma’s easily and quickly. I was called “Jane Ann” or “Janie”. It was fun to be so close to so many family member and have lunch with them or even better yet, stay over night. One of my cousins was an expert at telling me ghost stories that involved stairs and scary knife bearing guy named “John” who was clumping up the stairs to kill us, while her Day-Glo “Jesus in Gethsemane” shone eerily in the dark on her dressing table. It was all part of the fun of having the bloody wits scared out of me. Those were great times spent out at their farm. 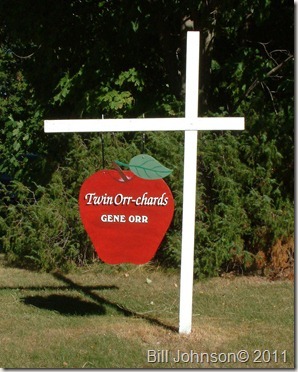 After my grandparents passed on, my two uncles renamed their farm “Twin Orchards”. Eventually my Uncle Ellis retired and my Uncle Gene farmed “Twin Orr-chards” until he could not farm anymore. The farm in the last year was sold to another family. One always hopes when selling the property, that it would remain a farm and not be developed into something horrid. 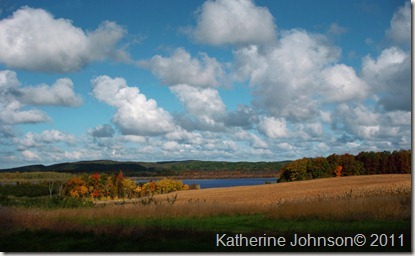 With luck and being patient, a family was interested in both houses and 1/2 of the farm. To date, the new owners call their farm “Echobend” and are operating a CSA Farm (Community Support Agriculture). That was a new term to me, but it’s been around for more than two decades. Personally growing up on a orchard type farm, I was well aware of the risks and shortfalls that come with farming due to weather, pests, the value or lack of value of the crop from year to year, and the tightening of pesticide use by the EPA. More and more young people have not wanted to continue the family farming business due to the time, effort, and risks involved. Land Stewards saw family farms selling out as a negative trend and over the last twenty years have slowly begun to turn farming around with this community shared farming concept. There are at least 4000 CSA registered farms across the country, currently. The farmer gets interested consumers to buy shares or 1/2 shares (if available) in return for fresh locally harvested fruits and vegetables. There may also be herbs, honey, maple syrup, fresh eggs, meat, specialty milk, fresh cut flowers, home made breads,cheese and perhaps even wool for spinning and weaving. An encouraging CSA farm will often include recipes with the produce to educate and expand the consumer’s taste for the fresh bounty.This can be done before the long days of farming and harvest begin. Farmers also have the advantage to have some working cash on hand during the season by offering shares for sale in the early spring. CSA farm members may be required to come to the farm to work once during the season or help with deliveries. Deliveries may be weekly or every other week depending on the time of season. Options for deliveries may be to a specific drop off site, directly to the home, or picked up at the farm. Some farms divvy up the goods equally in boxes or baskets for all members, while others may give members a choice to pick from what is available. One of my friends is currently a member. She said this is much easier that trying to grow veggies and fruit for herself in a limited space. This way she knows where her food is coming from and how it is being grown; it’s a win win situation. It is learning to eat “seasonally” grown local foods. CSA members will likely still have to shop for produce because the CSA farm won’t be able to provide for all of their needs, but that can be done at local farm markets that are held just about every day of the week in many areas. One other characteristic is many, if not most, CSA farms are organic and hold true to good ecological practices. So ponder this idea. Support your local farmers during the growing season. Be a locavore. Seek out you local CSA possibilities and maybe add some farm memories to your family’s experiences.